This tour is not intended to be a complete history of Omro, only a brief look at the past through the 50 properties described here. So that you can compare and see how some buildings have changed over the years, we have included historic photos when available. Please refer to the map provided for the location of each property and several suggested tour routes below. Short tour (Downtown Historic District) is less than a mile up and down Main Street, Omro. Medium tour is about a one and half to two miles in length and includes private residence throughout Omro. Long tour is three miles and includes all numbers except 47, 48, 49 and 50. The properties on this tour were selected for their geographical location within the city, original architectural condition, historical importance, and the willingness of the owners to allow their property to be on the tour. Every effort has been made to present accurate historical information. Out of courtesy to property owners, please do not approach or walk onto any property, disturb the owners, residents or their guests, litter or disturb the property in anyway. Thank you! It is hard to believe, but the beautiful riverfront park we see today was once a dumping ground known derisively as “tin-can alley.” Its transformation began in 1911, when H.B. Patch, then county superintendent of schools, persuaded the owner, H.C. Scott, a local lumberman and mill owner, to offer the land to the village if it would develop it into a park. Scott’s challenge was first taken on by the Omro Men’s League, but after their effort failed the project was then taken over by a group of local women calling themselves “The Women’s Civic Improvement League.” When the completed park was transferred to the village in 1924, this group had raised more than $5,000 through fairs, bake sales, and dinners, and transformed a former wasteland into what is now Omro’s showplace park. In 1933, a swimming pool and children’s wading pool were built using local money and federal C.W.A. funds, which was followed by the addition of a bathhouse and dock in 1939 using village and W.P.A. funds. A larger pool was built in 1969 with funds left by local banker, Arthur J. Marble (30). The pool was moved in 2000. In 2008, the American Bank Pavilion was constructed thanks to volunteers and funding from the American Bank, Omro Chamber of Commerce and the Omro Community. This large, massively built cream brick industrial building was built to house a woolen mill, but due to a financial panic, the machinery was never installed. The mill stayed vacant until the mid-1880s, when it housed the Thompson and Co. carriage works, one of Omro’s largest manufacturing concerns. 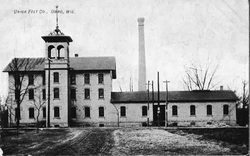 Afterwards it housed the Omro Felt Works, the Omro branch of the North American Hosiery Co., and other local enterprises. In 1928, the building was purchased by George Daggett to house his wholesale feed and produce business. 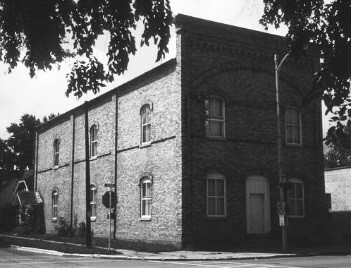 Daggett’s firm and those of his descendants continued to use the building until the late 1970s and it is still generally known as “Daggett’s Mill.” In 1987, the eastern portion of the building was removed and the mill was renovated and converted into apartments. One of Main Street’s more modest resources is this small concrete block building, which Anton Bang built in 1927, to house his meat market. Bang operated this business until he retired in 1936, and was then succeeded by others and by a restaurant that occupied the building for many years. This building is located within the Omro Downtown Historic District. Intact buildings such as this one, while not of the highest importance individually, are still of value for what they can teach us about the past. Intact historic streetscapes in small cities such as Omro are typically a mix of the large and the small, the elaborate and the simple, and the old and the not so old. Such diversity is valuable and needs to be respected. Built a decade before its neighbor to the west, this is the most elaborate of Omro’s several fine Italianate style commercial buildings, the arcaded second story windows being an especially fine feature. 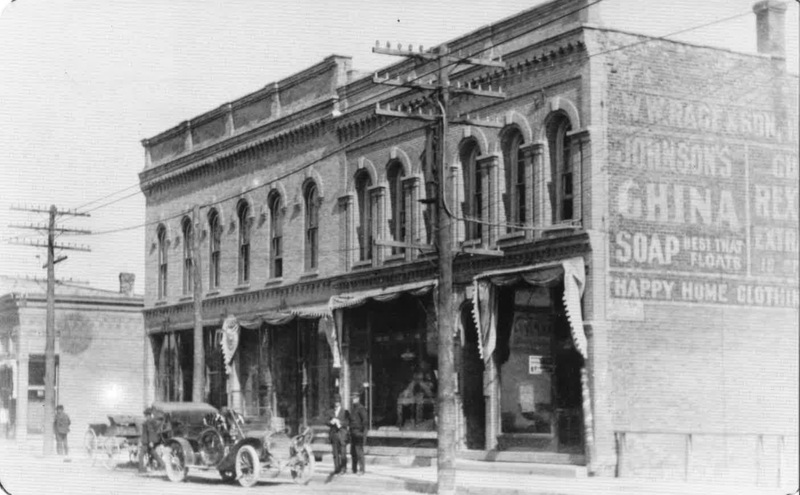 W.W. Race ran a hardware business in the west store for many years while the east store was first occupied by Demmon Bros. boot and shoe store. A few years later this space was occupied by a drugstore and drugstores have occupied it continuously since then. The most well-known pharmacist in this location was Clayton W. Stearns (22, 33, 43), who in 1933 allowed the first Omro library to be placed in his store. The library started as a shelf with books and later a back room was utilized to house the growing collection. The building is located within the Omro Downtown Historic District. This excellent Italianate-style cream brick commercial building replaced a two-story frame building built by Frank in 1857, which was destroyed by fire early in 1881. 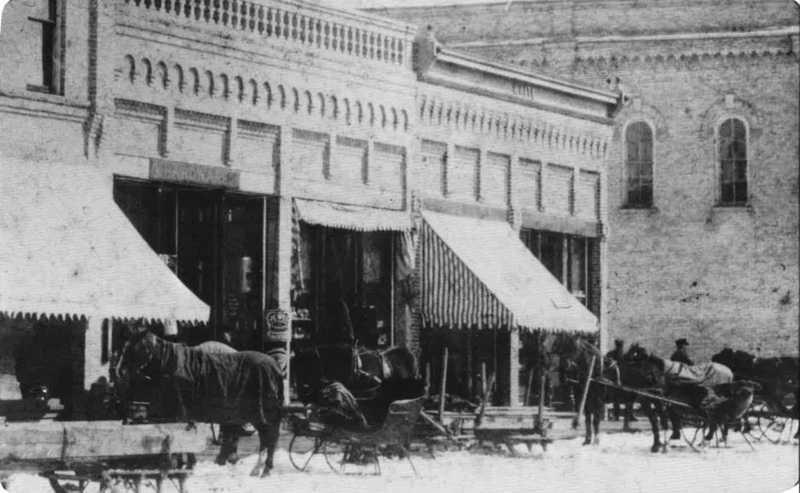 The first story originally contained two stores: a combination grocery/boots and shoe store in the corner space and an adjacent millinery store. The taller second story was given over entirely to a large meeting hall known as “Frank’s Hall”. The building is in the Omro Downtown Historic District. “Squire” Nathaniel Frank was one of Omro’s early pioneers, having arrived by steamer in 1850. 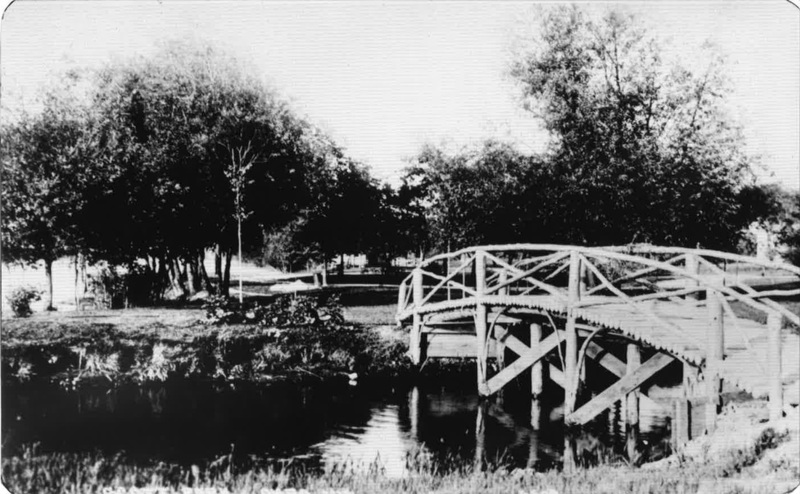 Frank was responsible for dredging out the south channel of the river with a team of oxen, which he then spanned with the village’s first bridge. 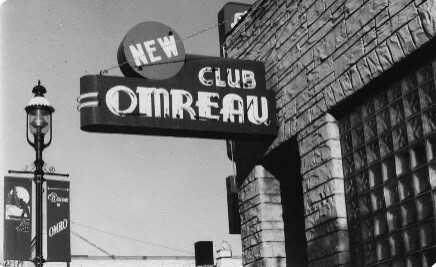 Together with Chauncey Bigelow, he was also responsible for starting Omro’s first store in a building just north of this one. This brick two-story building achieved its present form in the first decade of this century and it may incorporate within it part of the one-story Waite building that originally occupied this spot. The building we see today is a good example of the Twentieth Century Commercial style. Such buildings are wide and are generally simpler in design than their nineteenth century counterparts such as the I.O.O.F. building (8). Originally, two stores occupied the first story while the second story contained hotel rooms. The building is located within the Omro Downtown Historic District. This one-story double store building was built in the same year as the two-story Odd Fellows building next door. Except for lacking a second story, everything else, including the materials used, is essentially the same, including the tall corbelled cream brick cornice that crowns the facade and the cast iron posts that enframe the two storefronts. The building is located within the Omro Downtown Historic District. By 1884, A.B. “Bige” Larrabee was a major figure in the business life of Omro. Larrabee had earlier run the first Larrabee House hotel, located where the Masonic Temple is now (19), and he was running the Northwestern Hotel (11) under the same name when he built this building at 107 W. Main to replace one destroyed by fire earlier in 1894. The right-hand portion of this Italianate style-influenced building was built for the members of the Odd Fellows (I.O.O.F.) 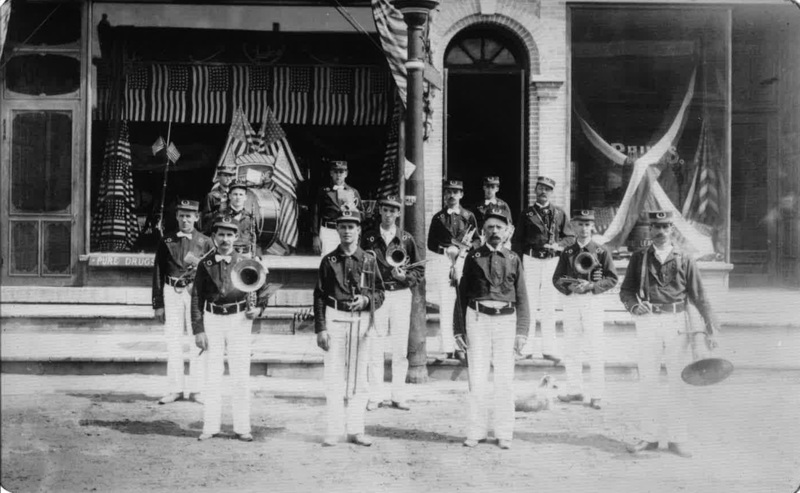 fraternal order in 1894 at a cost of $3,500. The two stores provided income for the Order and the second story was its meeting hall. The Order continued to gather in this hall until the 1990s, when much of its memorabilia was given to the Omro Area Historical Museum (18), where it is now on display. The left-hand portion of the building was built in 1912, and it was purposefully designed to match the original portion, which accounts for its, by then, quite old-fashioned design. The addition’s first story was used as a bakery until recently while the other stores have had many tenants. The buildings are located within the Omro Downtown Historic District. 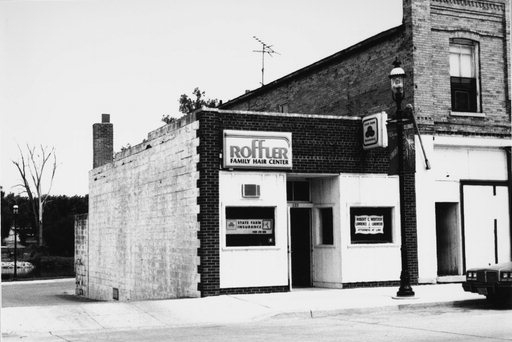 This building was built to house the Root Bros. hardware store. Its design was clearly influenced by the larger, slightly older I.O.O.F. building next door. Of special note are the still-intact cast iron posts that framed the original first story display windows. Such ornate posts were once a feature of most of Omro’s nineteenth century storefronts, but many have since been lost to remodeling. The Root Bros. sold hardware here until 1905, when G.W. Brooks purchased the building for his grain, feed, and farm machinery business. Then, in 1918, Frank Mitchell purchased the building and a portion of it was used as a barber shop by his son, Clyde Mitchell, until 1972. The building is located within the Omro Downtown Historic District. When this Italianate-style hotel was built it was the pride of Omro. Arriving guests were picked up by its carriages at the railroad depot a few blocks away, steamboats brought guests by river, and stage lines brought them to the front door. Awaiting them were twelve-inch-thick cream brick walls that enclosed a dining room and a “sample room,” while the guest rooms in the stories above were the best the city had to offer. 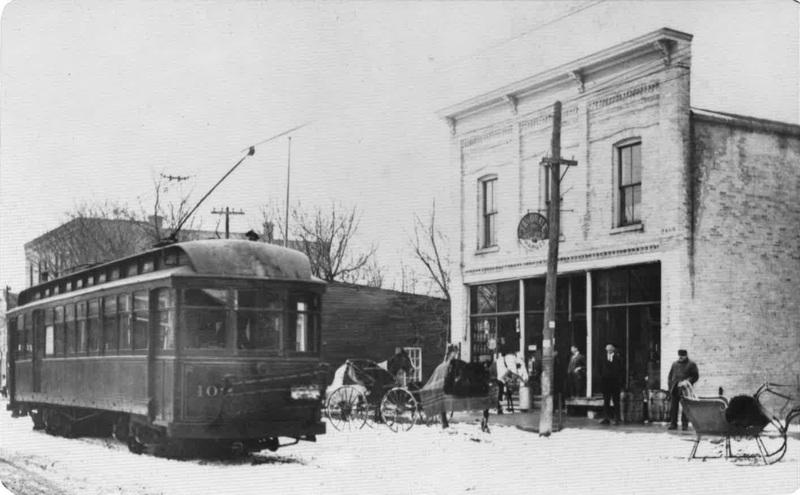 The interurban trolley line from Oshkosh, which started service in 1902 and ran until the late 1920s, ended in front of the hotel. The building is located within the Omro Downtown Historic District. Buildings like this were prized symbols of community growth, partly because of the size of the investment they represented and because they replaced the smaller, highly flammable wood buildings built in the pioneer period. The front half of this stone building was already here as early as 1887, when it was used as a blacksmith shop by A. Strauss. Undoubtedly, a fair part of Strauss’ trade was furnished by the large, now-vanished Lansing Livery Stable, which occupied the space between it and the Northwestern Hotel (11) to the east. By 1913, this former blacksmith shop had been lengthened to the north and was used as a veterinarian’s office. By 1929, the building housed an auto repair business. In 1966, it was purchased by Jerry Beck, who used it for his Yamaha sales and repair business. He and his wife Bev later opened a pizza parlor on the site and completed a facade renovation in 1994. As early as 1892 a part of this site was occupied by a two-story frame building that housed Lowry & Martin’s cheese factory. 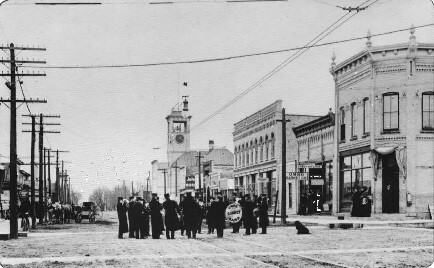 By the turn of the century this building was gone, but another larger one was erected just to the west to house the new frame creamery building put up by the Omro Butler & Cheese Co., which was formed by area dairy farmers in the late 1890s. By 1916, the success of the company made it necessary to expand the factory, which resulted in the construction of the first portion of today’s building. In 1922, another section was added to the east and others were added later. 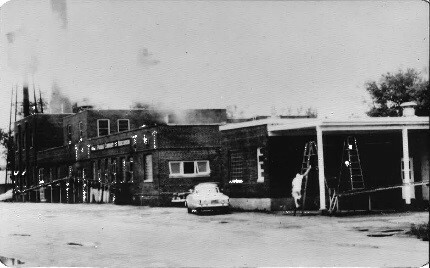 The company stayed in operation until 1944, when it was purchased by the Kraft Company, who continued to process milk and cheese here until 1962. 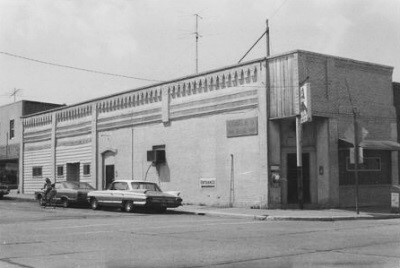 The building was then sold to the City of Omro due to the artesian well on the site and for use as a municipal garage. The original left-hand portion of this building was built as a saloon between 1900 and 1913. When the larger bowling alley portion to the right was added in 1950, the new main façade was extended across the front of the older building as well, creating the excellent late example of the streamlined Art Moderne style that we see today. Typical features of the style are the curved glass block sidewalls that flank the main entrance and the neon-lit handling sign, but the real treasure is the interior, which is still in almost totally original condition. The building is located within the Omro Downtown Historic District. This building was built by Fred Day and Monroe Phillips to replace one that was lost to a fire that destroyed the whole south side of this block in the late 1880s. 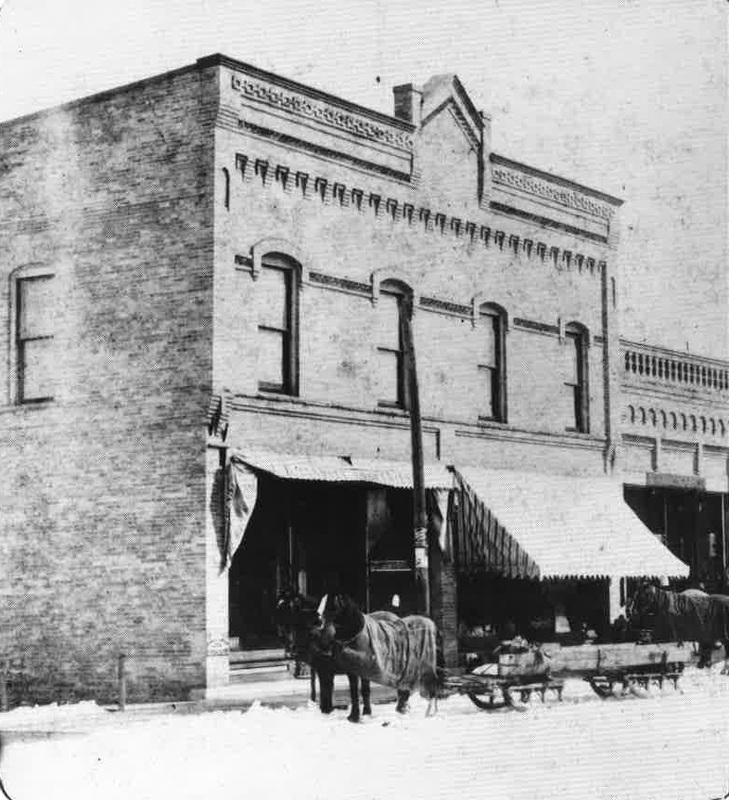 The earliest known occupants of this three-store building were Day and Larrabee, who ran a dry goods store in the front portion, and a meat market that occupied the rear store. This lot was once the site of George Shafer’s three-story brick block, which was Omro’s finest commercial building until it was destroyed by fire around 1878. The lot then sat vacant until Earle and McGuire built the cream brick building we see today in the last years of the nineteenth century. These men ran a grocery store here which was soon after succeeded by that of Henry Seifert, who operated his until 1923. The building was then bought by the Omro Co-operative Shipping Association and used as their store until 1966. The building is located within the Omro Downtown Historic District. This, the smallest wooden facade building on Main Street, was built between 1887 and 1892 to house an insurance office and later the Journal office, a newspaper in Omro. Chance has dictated that it has survived while the much more impressive brick commercial buildings that once flanked it have not. This is its real significance today, it has survived. If we are to preserve the spirit of our communities we must also work towards preserving our historic past. Once our buildings are gone, their history cannot be recaptured, their stories have ended. While the buildings that once flanked this one have now been lost, they can still teach us an important lesson about community preservation. 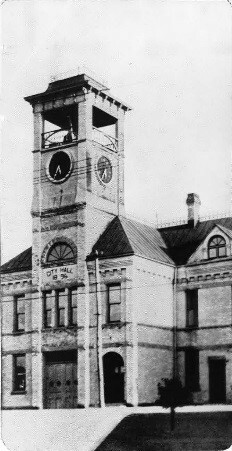 The five-story-tall clock and bell tower of this outstanding Late Victorian-style building has been Main Street’s most prominent landmark since the day it was completed. Designated as a combination municipal building, fire station and jail by architect F.G. Root and constructed at a cost of $5,000, this building is a beautifully preserved reminder of the days when a community’s governmental services could be comfortably housed in a single moderate-sized building. What sets this building apart is the extraordinarily intact state of its exterior and interior. The original tower clock is still wound by hand once a week. The building, vacated by the city in 1966, was saved from demolition by a 1967 referendum. Its windows were also replaced in 2014 thanks to the collaborating efforts of the City of Omro, Future Omro Chamber-Main Street Program and the Omro Area Historical Society. The building now houses the outstanding collections of the Omro Area Historical Society’s museum. The Omro Lodge of the Masonic Order is the city’s oldest fraternal organization, having been chartered in 1867. At first the Lodge occupied a series of rented halls, but in 1891, upset with the high price of these rentals ($10 per month), the members decided to build a hall of their own. 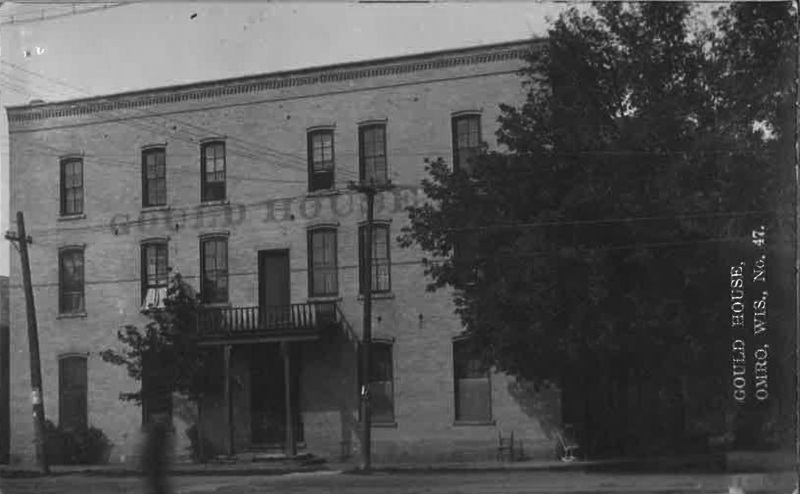 A lot was purchased for $600 and a $2,000 loan from member W.W. Race (4) allowed the Lodge to construct the fine cream brick building that is still its home today. The City of Omro purchased the Masonic Lodge in 1999, it houses part of the city’s historical collection. Masonic Temple’s windows were entirely bricked in due to the 1970’s energy crisis, until a few windows were restored in 2000. 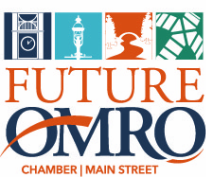 In 2015, all of the windows were restored due to the collaborating efforts of the City of Omro, Future Omro Chamber-Main Street and Omro Area Historical Society. 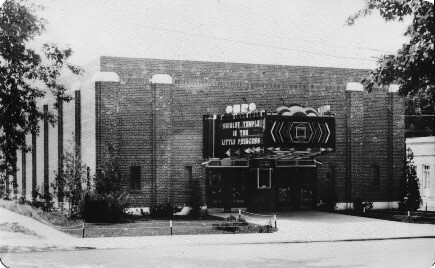 One of the few buildings in Omro’s downtown built during the Depression years was this fine late Art Deco-style movie theater, which was built using federal W.P.A. funds. Although simple in design, the massive buttresses that line its sides give it a monumentality that is unusual for such a small building. During World War II shell casings were manufactured in the basement by the Speed Queen Corp. while movies were being shown in the theater above. Later, a ladder factory occupied the basement. In 1966, the City remodeled the building as its new city hall and library. The library moved to a new building in 1986 and the city hall was once again remodeled in 1993. This house, with its combined Greek Revival-style and Italianate-style features, was built in the late 1860s for Samuel Shaw, who from 1860 to 1870 was the principal of the “Old Red Brick School” in Omro. 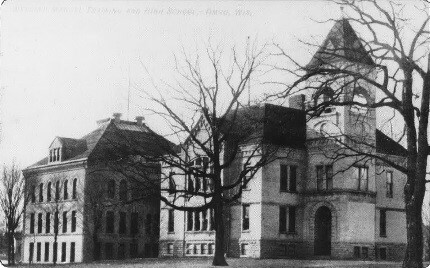 Located on the corners of Webster Avenue and Larrabee Street, this school, which was built in 1856, served Omro as a combination primary and secondary school until the new High School (28) was built in 1893, after which it was torn down. 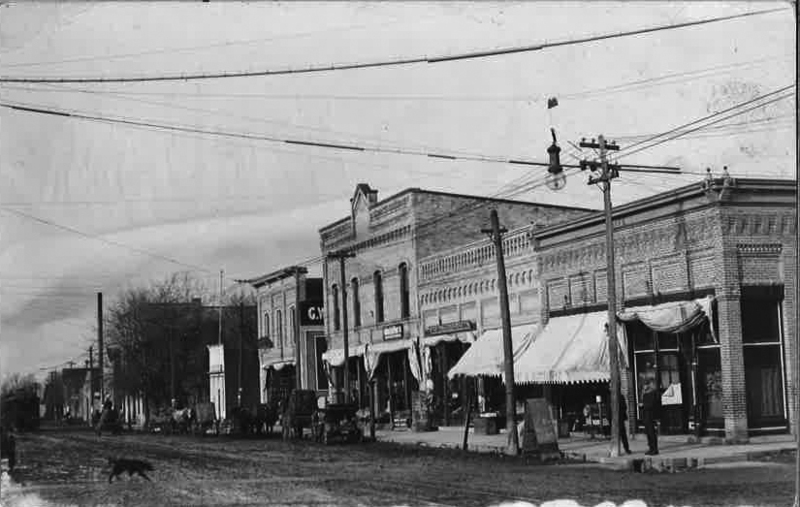 Shaw, meanwhile went on to become the founder of Forest County and the city of Crandon, its county seat, in the 1880s. His Omro house was later owned by William Rhodes, who as clerk of the school board utilized one room as a bookstore from which students purchased textbooks. This house is one of several buildings (33, 43, 4) on the tour associated with Stearns, who was a pharmacist in Omro from 1925 until 1972. Stearns was also an extremely popular elected official who was village president from 1933 until Omro became a city in 1944, after which he served as mayor until 1960. 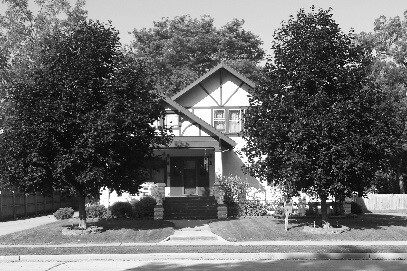 This house, one of Omro’s few 1920s Period Revival style buildings, was built in the Tudor Revival style because Mrs. Grace Stearns had seen similar houses in Milwaukee and liked them. Reputedly, this house was paid for from one years’ sales of radios from Stearns’ store. Later, Edwin Sheppard, another Omro mayor, lived here as well. Unlike the orderly, generally symmetrical designs of the Greek Revival-style and Italianate-style houses that preceded them, Queen Anne-style houses typically have irregular plans, asymmetrical design, and wall surfaces that are clad in a variety of materials, including clapboard and wood shingles. All of these features are present in this fine Queen Anne-style house and also in the very similar design of the somewhat more elaborate house across the street at 315 S. Webster Avenue, which was built between 1900 and 1913. Like all of Omro’s earlier church congregations, Grace Lutheran at first had to make do with makeshift quarters in a series of rented spaces until they had grown large enough to build a church of their own. When the congregation finally built this charming Neo-Gothic Revival-style stone church at the end of the Depression, it was the first real home they had ever known. By 1962, though, the congregation had outgrown this building, so after their new church on South Jackson Avenue was finished, the old church was sold and converted into the unusual single family residence we see today, the only home in town with its own belfry. 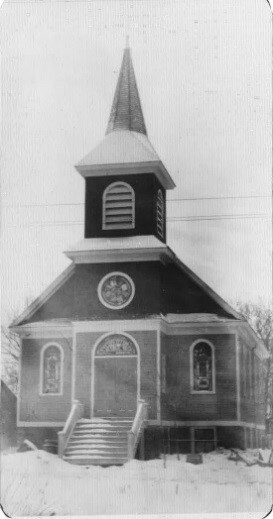 Omro’s Presbyterian Church organized in 1851. The members’ first meeting was in the toll house of a float bridge that spanned the Fox River. Worship continued in a variety of places until the members were finally able to build the church we see today, after a several year delay caused by the Civil War. This Greek Revival-style building has seen a number of changes since it was built. In 1881, the church was raised and a basement story was added. Later, the main façade was altered, and in 1951 it was altered again and the rear addition built. In 2003, the church built a new facility on North Webster Avenue, took the steeple, stain glass windows, and the bell from the old church for use on the new church, and sold the building. One of Omro’s finest nineteenth century homes is this massively built brick, Italianate-style house, which was owned by Archie Race, the son and business partner of William W. Race, whose hardware store was one of Omro’s notable post-Civil War business enterprises (4). Typical features of most Italianate houses are wide, overhanging eaves that appear to be supported by heavy wood brackets. The Race House is no exception, and it is also notable for the gable-roofed wall dormers that are centered on its main façade and on both of its side elevations, each of which is decorated with small heart-shaped windows. Originally, the Boy’s Building was a stucco-clad example of the Bungalow style, but it was remodeled into apartments in 1993 and the stucco is now covered with siding. 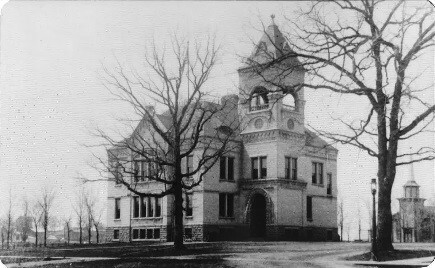 A bequest of $50,000 by Omro sawmill owner and Legislator Hiram Webster in 1883 to be used for “a building to educate young people in the domestic and useful arts” ultimately resulted in the construction of this cream brick Romanesque Revival-style building, one of Wisconsin’s earliest manual arts training schools. The designer of the school was Allan D. Conover, a professor of engineering at the University of Wisconsin in Madison and an architect who specialized in the design of Institutional buildings. The ground floor of the Webster Building was given over to metal working and woodworking. The first story was used for drafting and for more skilled applications of metal and woodworking activities, while the second story housed the domestic sciences of sewing, cooking, and home design. A small gymnasium occupied the top floor. The building was renovated in 1995 into apartments for senior citizens. The original right-hand portion of this cream brick, Late Victorian-style building, with its towered, asymmetrically placed main entrance, is an excellent example of the eclectic designs produced in the last years of the nineteen century. 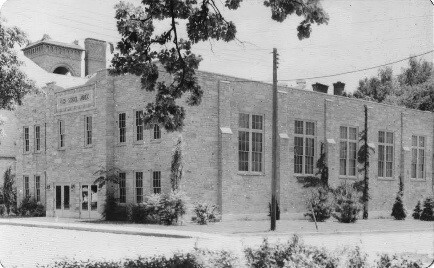 Designed to house Omro’s entire school-age population, the new building caused school attendance to increase to such a marked degree that in 1909 a new matching addition was added to the left of the original building, creating the roughly symmetrical design we see today. The school was listed in the National Register of Historic Places in 1985. The high school building was the pride of the village when it was built, being by far the largest public building ever constructed in the village. The building was used as a high school until 1964 and as a middle school until 1983. In 1993 it was listed as one of the state’s 10 most endangered historic properties by the Wisconsin Trust for Historic Preservation. It was remodeled in 1995 for use as a Community Based Residential Facility for senior citizens. This fine, highly intact Victorian era house is now most closely associated with Arthur J. Marble, who lived here from 1940 to 1963. Marble was born in nearby Winneconne in 1880 and began his 63 year career with Omro’s Farmer’s Bank in 1903 as a bookkeeper. In 1940, Marble became the president of the bank and he served in that capacity until his death, by which time he had become a wealthy man. Of this wealth, $296,000 was returned to Omro in the form of a legacy Marble left to the city which was to be used to improve the swimming pool and which resulted in a new pool in 1969 (1). These funds, held in trust, are still used today to improve the Omro park system. C.D. Bowman, a prominent Omro pharmacist, built this superb clapboard- and shingle-clad Queen Anne-style building, which is Omro’s grandest nineteenth century residence, shortly after receiving a large inheritance from a relative. Bowman’s new wealth allowed him to use the best craftsmanship and the finest quality materials. These things survived even after fire burned off the top story of the house a few years after it was built, resulting in the truncated but still impressive house we see today. Bowman and his wife summered in Omro and wintered in Florida. Later, the house served briefly as a nursing home, but it was converted back into a single family residence in 1968 and remains so today. Gothic Revival-style pointed arch doors and windows, coupled with Greek Revival-style corner pilasters and returned eaves, are evidence of the steady growth and evolving architectural heritage of St. Mary’s church. Originally built in 1866, the frame construction clapboard-sided church was first enlarged between 1913 and 1918, when the beautiful stained glass windows were installed, and once again in 1935 when the building was moved onto a new full basement story. The most recent addition occurred in 1989, when the sensitively designed St. Mary Center was constructed next to the original church at a cost of $500,000. One of the more common historic residential building forms in Omro is the gabled ell form, so-called because it has a front-facing gable-roofed main block, to one of whose side elevations is attached a second gable-roofed main block, to one of whose side elevations is attached a second gable-roofed wing or ell. One of Omro’s best examples is the elegant Greek Revival-style house built for James Bonnell out of brick that was manufactured on the west edge of the city. This house has been the home of several Omro notables, including William Blackburn and grocer George Stearns and his wife, Maude, who were the parents of Clayton Stearns (22, 43, 4). In the 1920s, Clayton Stearns and Allen Gensch started one of Winnebago County’s first radio stations on this property. This Craftsman-style building was constructed to house Dr. Russell, his wife, Maude, and their five children. The area surrounding their house was then known locally as “Piety Hill” because of all the families there who were active in church work. The next owner was Sherman Leighton, president of the Omro Electric Light Co. and vice-president of Farmers Bank of Omro. The home was then purchased in 1921 by Daniel Jones, a farmer, and his wife, Edith, a nurse, who lived there until 1950. Another of the three fine clapboard-clad, Italianate-style houses on the tour (21, 41) is this one, which was probably built in the 1860s or 1870s. These houses are all characterized by their shallow-pitched hip roofs and their broad eaves, which are supported by elaborately carved scroll-shaped brackets. They are also all of similar size and design and have their front entrance doors placed either to the left or right of the main façade. In addition, this one has a second story windows that are enframed with wood, the upper pieces of which project out further than the sides, a typical Italianate style touch. This very fine, intact, and immaculately restored gabled ell form house was owned for many years by local attorney W.E. Hurlbut, who maintained a law office on the second floor of W.W. Race’s hardware store building (4). Hurlbut, who was later elected a judge, had a long and successful career in Omro. For many years local children considered this house to be haunted because of a thick screen of trees that hid it almost entirely from view. Eventually, the trees were cut down and the building was converted into apartments, but now it is once again the single family home it was meant to be. When the Hurlbut house was still new the crown of the hill above was owned by the Larrabee family. After Mrs. Mary A. Larrabee passed away in 1881, she was buried in the yard to the left of the Larrabee homestead. 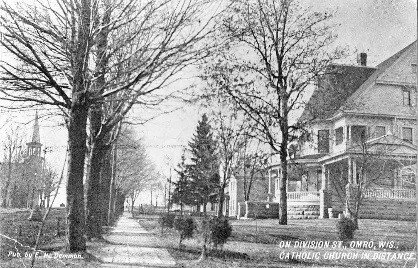 In 1883, her two sons gave the homestead to the Trustees of the First Presbyterian Church (25) to be used as the home of its minister with the stipulation that the minister had only to “acknowledge his tenancy by paying the Trustees one ear of Indian corn per year as rent of said premises.” When this house burned down in 1898, the Larrabee sons replaced it with a new one the following year. 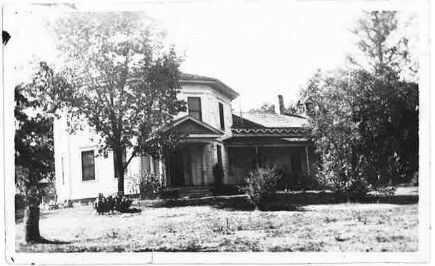 In 1968, though, this house was sold and a new manse was built next door at 1037 S. Webster Avenue. Mary A. Larrabee’s grave and headstone is still located behind the new manse and the old one can be seen next door. This former farmhouse is one of Omro’s larger, more elaborate late Victorian era houses. Especially notable is the very intact decorative woodwork located under the eaves of the main roof and under the eaves of the dormers that face onto Waukau Road. This degree of decoration is unusual for a turn-of-the-century Wisconsin farmhouse, but farmhouses located close to a town often imitated the more elaborate houses in town rather than the simpler ones in the outlying countryside. Omro is particularly rich in smaller Greek Revival-style houses, most of which date from the 1850s to the 1870s. Typical details found on these buildings include full-height pilasters that wrap around the corners in imitation of columns, returned eaves, and triangular temple-time pediments that crown the main part of the house. All of these features are present on this house, which is one of Omro’s most intact examples. The semi-circular arched second story windows, however, are an unusual feature that is not often found on examples in Wisconsin’s smaller cities. 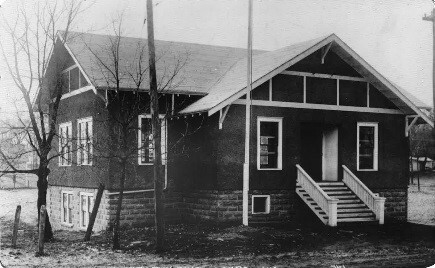 The continued growth of the high school’s student body following World War I overtaxed the available gymnasium facilities in the top floor of the Webster building and forced the school board to rent the now-vanished American Legion Hall building for athletic contests, plays, and parties. Finally, in 1933, interest on money not spent for the construction of the Webster building and bonds sold by the Village were combined, Madison architect Edward Tough was hired, and with W.P.A. assistance the new Lannon stone-clad gymnasium/auditorium building known as the “Annex” was completed in 1934. Most of the interior of the new building was given over to the gymnasium/auditorium, which had a raised stage across one end. Like the rest of the High School complex, the Annex building was renovated in 1995. Split into two floors the old gym now houses the Omro Area Community Center. The ticket booth in the entry foyer is the only remaining piece of the original interior. This outstanding house is yet another excellent Omro example of Italianate-style design. Of particular note here is the broad frieze band that is placed below the overhanging eaves of the roof. The linked circles that decorate this band make it the most elaborate one in Omro. Also notable are the molded hoods visible above the second story windows and the intact wraparound front porch, which is supported by slender paired and tripled columns set on panelled bases. Eugene Earle was a man who kept abreast of his times. He came to Omro in 1864, near the end of the Civil War, and for the next 60 years was active in a host of varied business enterprises that sold everything from coal and grain to milking equipment and agricultural implements. He also owned the first automobile in Omro and was the city’s pioneer auto dealer (Oldsmobile). When Earle built this, his last home in Omro, it was the most modern house in town, a stucco-clad Craftsman-style Bungalow with both Tudor Revival features (the false half-timber work in the gables) and Prairie School ones as well as its grouped and banded windows. Only the closet look at this fine Colonial Revival-style house reveals that it began its existence as a Gothic Revival frame church. Originally, the main entrance of what was at first a simple rectilinear plan building faced west onto Jefferson Street. 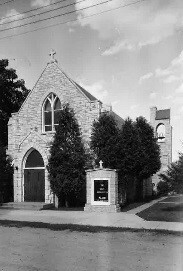 When Mrs. Grace Stearns, who lived east of the church (22), heard that it was to be converted into a freight depot for trucks, she and her husband purchased it, turned it ninety degrees, expanded it, gave the stained glass altar window to the Presbyterian church (25), and converted the former home of Omro’s Episcopal congregation into the house we see today. Now, the only evidence of the church’s original appearance is the scroll-sawn Gothic Revival style wooden bargeboard decoration that is still in place under the eaves at either end of the house. 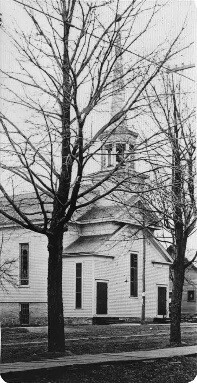 In 1909, a group of Omro citizens of German descent met to form a Lutheran church where they could worship in their own language. Aided by the pastor of a similar church in Oshkosh, Rev. G.M. Weng, the members organized and by February of the following year they were worshipping in the newly dedicated church building. When St. Luke’s congregation became too small to keep up their church, the building passed into the hands of the Omro VFW post, and then to the Assembly of God Church, before it was converted into private usage in 1986. 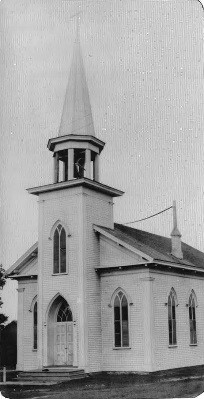 Despite these changes in ownership, this center steeple-design church is still in a highly intact state today and retains most of its original features, including the original clapboard and wood shingle siding. Missing is the stain glass window once located above the entry door, which is now on display at the Omro Area Historical Museum (18). Directly on Omro walking bridge, house on island in the Fox River, end of S. Webster Avenue. This island, located between the north and south banks of the river, was long associated with members of the Clark family, beginning with Caldwell “Cad” Clark, who leased the island from the government for 99 years in the 1870s. Cad and his brother George Clark developed the island and lived in the home just east of the bridge. Later when Cad married, he built his house west of the bridge. This house was removed in 1971. The last buildings to be erected on the island were two summer cottages in 1914. The Clark family lived by fur trapping and river dredging, but were best known as boat builders. Cad Clark’s wife, Ida, later became a noted Wisconsin poet and songwriter. A toll bridge was built over the Fox River at this site in the early 1850s; this was followed by a public float bridge in 1861, a draw bridge in 1864 or 1868, and a lift bridge in 1916. These bridges opened from the shoreline to the south of the island so that boats could pass up and down the river. The northern portion of the bridges were stationary. A new bridge was built west of this location in 1971 and the 1916 bridge was floated up stream to Eureka, where it remained until 2013. This left the island residents without an access route to the city. It was at this time that a foot bridge was added. Two blocks north of the Omro walking bridge. Omro developed on both sides of the Fox River, but the south side was settled earlier, in the early 1850s, because it was “Government land”, whereas the north side was considered “Indian land”. Later, after the Indians had been resettled, the north side was developed as well, but the early advantage of the south side was never really overcome. One of the finest houses on the north side is this red brick Italianate style-influenced, side-gabled ell house, which was long owned by retired farmer William Hough, who came to Omro with his parents in 1851, when he was one year old. West of the Omro car bridge on State Highway 21. This usually large Greek Revival style-in-spired, Victorian era house is a testament to the rich farmland that the early settlers of Omro Township made out of the flood plain of the Fox River. Houses such as this were sometimes built as a kind of reward that successful pioneer families treated themselves to after spending years in primitive log and small frame buildings and after enduring decades of backbreaking labor. While they may still seem old-fashioned to us today, the large houses such as this one that succeeded the pioneer era dwellings were once the epitome of modernity, providing their new owners with space, light, large up-to-date kitchens, modern conveniences such as indoor water and plumbing, and occasionally, central heating. Approximately two miles west of the Omro car bridge on State Highway 21. One of Omro’s most unusual structures is this seven story brick-clad steel and reinforced concrete tower, which is attached to an otherwise sedate Italianate-style brick farmhouse. The tower was built in 1935 by F.S. Cole, who in 1923 bought the former Charles King farm and King’s 1870s house in order to raise silver fox for their fur. 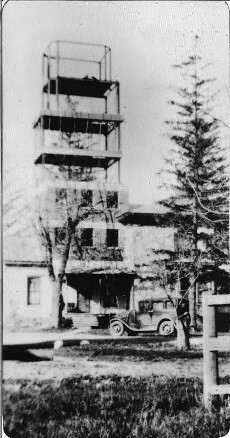 By 1935, the 500 foxes on Cole’s farm represented a valuable, but very portable investment so Cole and his son Bruce built this tower, which replaced an earlier and smaller wooden one, both to guard their foxes and to supervise them from a distance. The raising of silver fox was a major industry in the 1920s and ‘30s, with the best pelts selling for more than $500 each. 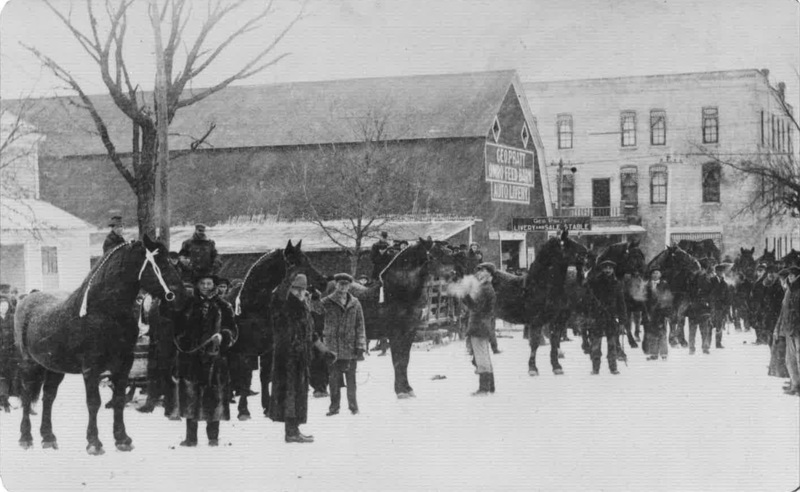 By the 1930s, more than half of all the fox pelts produced in the U.S. came from Wisconsin. In recognition of the Cole Watchtower’s unique place in Wisconsin’s agricultural history the tower was listed in the National Register of Historic Places in 1978. From Washington Avenue, go west on Michigan Avenue slightly less than 1 mile. Octagonal-plan buildings were first championed by Orson Squire Fowler, who publicized them in his book, A Home for All, in 1848. Perhaps because a still-standing octagonal building Fowler saw in Milton, Wisconsin, greatly influenced him, Wisconsin subsequently became one of America’s most important centers for Octagon-style building construction. The Challoner house, with its polygonal rooms and masonry walls, is a typical example of this very rare style. Samson Challoner was an early settler of Omro Township who began this house shortly before the Civil War, and finished it after the conflict. It has in the Challoner family for generations. Take Waukau Road going southwest. The newer portion of the cemetery is ½ mile and the older portion approximately 1 mile from tour #39. The first portion of the 20 acre Omro cemetery was donated by Milo Bushnell in 1846. 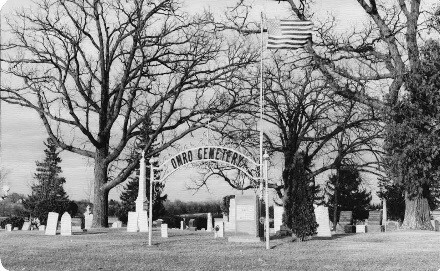 In 1851, the Omro Cemetery Association was formed and this group superintended the growth of the cemetery in the years that followed. In the early 1880s, an effort to transfer the remains of Civil War veterans and their wives from other parts of the Town of Omro to this cemetery was begun. The more than 250 known veterans of this great conflict now buried here constitute one of the largest, if not the largest, concentration of Civil War dead in Wisconsin. The exceptionally well maintained and documented burial group visible today is a testament to the unstinting care that the Cemetery Association provided. In 1990, the Association requested that the City of Omro take over the now considerable task of maintaining the cemetery, which today has more than 9,500 grave sites.